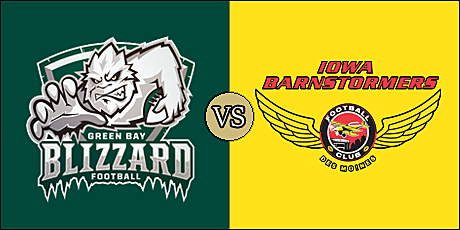 What: The Blizzard head out on the road for the first time this season to face the Barnstormers. 2019 Head to Head: May 19 - Barnstormers at Blizzard. Note: With byes in weeks 1 and 4, and three road games, this is the only home contest in the first six weeks of the season for the Barnstormers. The Blizzard are 1-1 overall and 0-0 on the road. They are coming off a 53-52 home win over the Nebraska Danger on March 1. The Barnstormers are 1-0 overall and 0-0 at home. They are coming off a 53-39 road win over the Quad City Steamwheelers on March 3. This will be the fifth season Green Bay and Iowa line up against one another, and the 13th matchup between the teams. The Barnstormers lead the series, 9-2, including a 3-0 sweep last season. 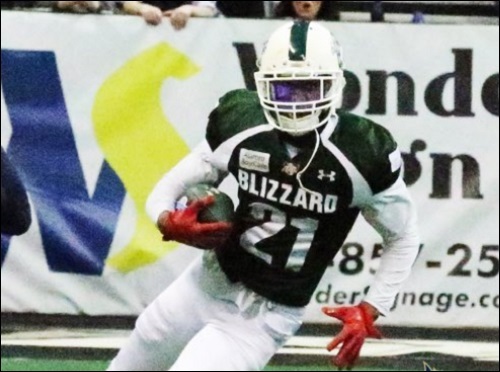 The Blizzard are undoubtedly in good spirits after a last-minute win over the Nebraska Danger last week. The contest was much of a back-and-forth, and the Blizzard captured the win courtesy of a six-yard run by Lenorris Footman with 25 seconds remaining. Cory Roberson's group would love nothing more to knock off the defending champs in this one. Iowa has some new faces, but they looked like their 2018 selves as they held off the Quad City Steamwheelers in Moline last week, 53-39. The offense was solid and the defense was opportunistic (just as during last season). 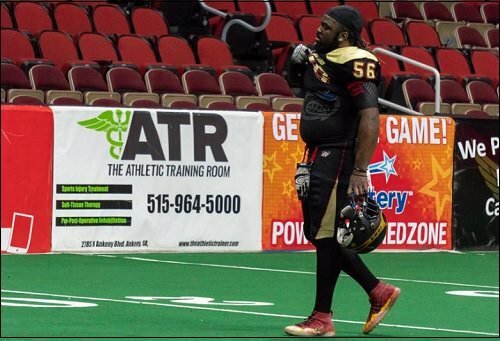 The Barnstormers seem to have replaced last season's IFL Most Valuable Player, Drew Powell, with Daquan Neal. The appropriately named Lenorris Footman is second in the IFL with 81.0 rushing yards per game and is third with five rushing touchdowns. He has completed 23 of 45 passes for 251 yards with three touchdowns and three interceptions. Kamal Cass has complimented the rushing game, having gained 46 yards on 10 carries with a touchdown. Hall of Famer B.J. Bill has accumulated 115 yards on seven receptions with a touchdown grab, and has a rushing touchdown as well. Levi Copelin caught eight balls for 60 yards, and Kezlow Smith has a pair of touchdowns through the first two games. Defensive back Marquez Gollman leads the defensive attack with 14 total tackles, two interceptions and a fumble recovery. Fellow DB Jadar Johnson and linebacker Dayshawn Taylor each have 11 total tackles, while lineman Truett Box leads the team with 1.5 sacks. Former Barnstormer Cody Barber has made all eight of his point after attempts, and converted on two of three field goal tries. The Barnstormers have the daunting task of a bullseye on their backs as they attempt to repeat as IFL champions. Neal was impressive in his Iowa debut. He completed 10 of 11 passes for 154 yards and five touchdowns, and ran for 41 yards and another score, against the Steamwheelers. Right down to the jersey number, he looked reminiscent of Powell from last season. Jamal Tyler also found the end zone on the ground. Veteran receiver Ryan Balentine was a solid target, hauling in five passes for 85 yards and three touchdowns. Connor Hollenbeck and Samuel Charles each caught a touchdown pass in the opener. Defensive back Jourdan Wickliffe tallied eight total tackles last week. DB Jajuan Harley had a sack, while DB Jeremy Gloston recovered a fumble. Tyrell Pearson returned a kickoff for a touchdown against Quad City. Nathan Criswell made five of seven point after attempts, and did not attempted a field goal last week. We will have periodic updates of this and our other two games this evening; Strike Force at River Kings and Storm at Danger. There are no stat updates for this game. This has been an issue with the IFL this season. We will updated as soon as information becomes available. A Neal to Balentine touchdown puts Iowa up 6-0 early in the first. Daquan Neal to Connor Hollenbeck for a touchdown pass. Barnstormers lead 13-3 in the 2nd. Nathan Criswell hits a field goal for the Barnstormers. They lead 16-3 in the second quarter. Touchdown pass to Samuel Charles puts the Barnstormers ahead 22-3 in the 4th. Iowa has gone up 28-3 with 2:27 left in the 4th quarter. Jamal Tyler scores for Iowa to put them up 35-3 with 1:08 to go. Iowa scores on a long 8nterception return to go up 41-3 at end of the 4th quarter.